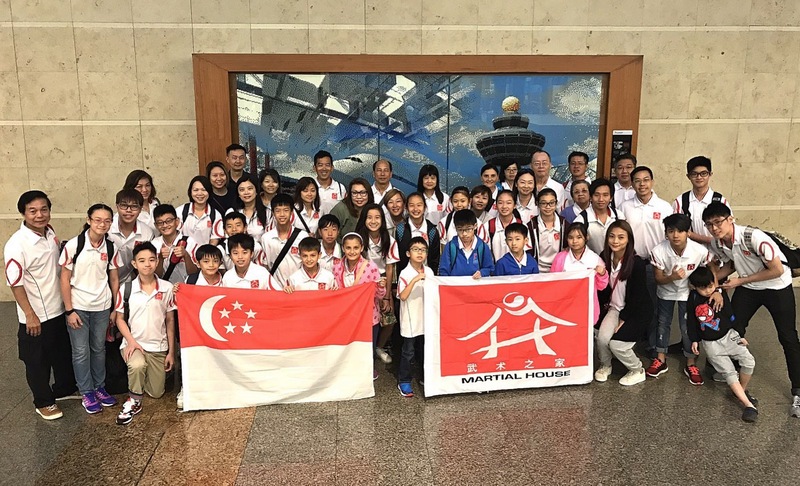 From 2 to 6 December 2016, 58 representatives from Martial House flew to Penang, Malaysia to participate in the 3rd Ding Feng Cup International Wushu Championship! The athletes have done us proud by attaining a total of 22 Golds, 6 Silvers, 7 Bronzes & 9 Consolidation Prizes, including a Silver and a Bronze in the Optional Group Event of the Primary and Secondary School categories respectively! When asked about their competition experience, athlete Ryan Tan shared, “The sense of achievement when I knew my results was indeed pleasing, but I felt that I have achieved so much more. The people who were there; the friendships we forged and the bond with our family were precious.” Fellow athlete Melissa Mak who competed in the group event also added, “The best part was not about getting medals. It was the moment when we showcased our group routine which we had painstakingly prepared and knowing that we have gave our very best! The results didn’t matter, what matters most was the support we have from everyone, including our competitors.” After the conclusion of the competition, the contingent visited the various attractions in Penang! From Penang Hill to Kek Lok Si, Chew Jetty to Macallum Street Night Market, it was a great tour for all as we do not get to see much scenic views and and experience the “kampong” lifestyle in Singapore! Here are some comments and reviews by parents regarding the trip: “A competitive event that turns out to be a fun and bonding trip. Great exposure and great companionship among all athletes and supporters. Enriching for kids and rewarding for parents.” – Mrs. Tan, Ryan’s Mother “Great experience for all the kids at higher level of competition. Regardless the results, hope they have learnt from one another about Wushu and beyond. Through this trip, we have made new friends and deepened our friendship as one Martial House family. The end of this trip marks a new beginning for all with a positive and motivated mindset! Together, we learn to understand the true values of Wushu and Martial House. Thanks for all the hard work, precise time and sacrifices to make this trip a priceless one for all!” – Mr. Chia, Kai Ming’s Father “Unity and kampong spirit were displayed by the coaches, parents and students in this trip. Students have learnt to work as a team, support and look out for each other. Winning is not the most important aspect. Teamwork and life skills learnt were the most valuable takeaways for the athletes.” – Mrs. Kwan, Kang Sin’s Mother “Despite the long hours at the competition venue, we were very touched by the cohesiveness and support of the whole Martial House. One Martial House, one family!”, Mr. Teo, Shaun’s Father “This Penang trip definitely let Zachary experience the bigger world of Wushu beyond Singapore. This is also his first overseas trip without us parents. Together, it is an invaluable experience for him. Thank you to all coaches, parents and friends who were always looking out for Zachary and taking care of him. He had a great and wonderful time!” – Mr. Ng, Zachary’s Father “Every moment is a precious and memorable experience for us as parents and our children too. It was a great family bonding for our own families and the Martial House big family” – Mrs. Mak, Melissa’s Mother Once again, Martial House would like to thank all the coaches for all the planning and coordination to make this trip possible, the parents for all the support and assistance and the athletes for the active participation to make this trip a memorable one! Not forgetting the organiser, Ding Feng Wushu Academy for making our stay and experience in Penang a pleasant one! Looking forward to the next overseas trip!